Edel Assanti and Proyectos Ultravioleta are pleased to present BOTH ENDS, a group show presenting interdisciplinary work by fourteen artists from Latin America. Alberto Rodríguez Collía, B-Lo, Buró de Intervenciones Públicas, Byron Mármol, Carolina Caycedo Lucía Madriz, Jesús "Bubu" Negrón, Jonathan Harker, Juan Pablo Echeverri, Naufus Ramírez-Figueroa Pablo León de la Barra, Radamés "Juni" Figueroa, Regina José Galindo, Stefan Benchoam. BOTH ENDS undertakes a reading of everyday social realities and cultural practices in the UK by a generation of artists from a comparatively 'new' geography to the occidental stage of contemporary art. Employing a self-referential, playful approach to producing art, the works in this exhibition aim to subvert traditions inherent in British society - monarchy, empire and the stiff upper lip - with the sense of humour and nonchalant fluidity characteristic of their Latin American cultural heritage. 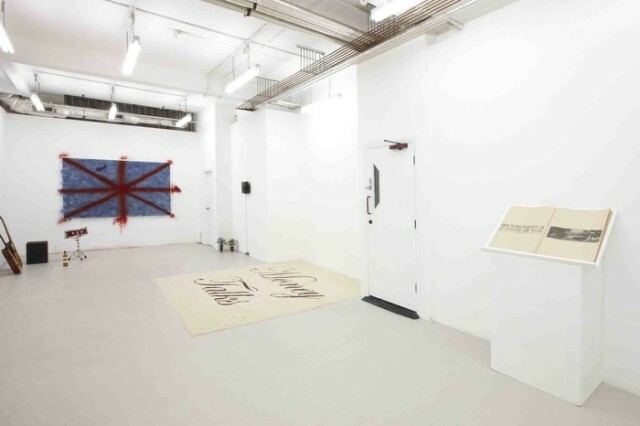 Some of the works engage with British ideas and institutions from a subjectively Latin American point of view, whilst others seek to generate symbolic equivalencies between analogous phenomena in their home countries. Underpinning all the works in the exhibition is a desire to establish a dialogue between Latin American culture and an art history specific to the United Kingdom. Proyectos Ultravioleta is a multifaceted platform for experimentation in contemporary art, founded in 2009, and based in Guatemala City. It's an initiative dedicated to the production of art exhibitions, multidisciplinary projects, discussion forums, loud concerts, happenings, public interventions, as well as a platform for intermediation between other local and foreign projects.